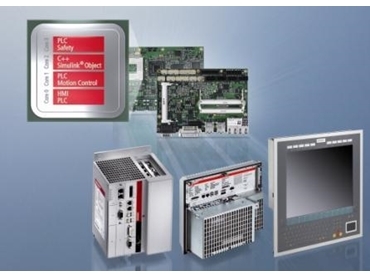 BECKHOFF Automation is proud to present a new industrial PC generation based on the new CB3054 3.5" motherboard, developed exclusively for multi-core processors and representing the optimum basis for modern PC-based control technology. These new 3.5" motherboards are at the heart of the new industrial PC generation. On the basis of the Intel GS45 chipset, the motherboard combines multi-core technology with a socket in the 3.5" form factor. Beckhoff industrial PCs can be equipped with various multi-core processors, such as the Intel CoreTM2 Duo or CoreTM2 Quad, and also with inexpensive Celeron processors with two cores. These proprietary-developed motherboards feature a number of on-board interfaces, such as SATA, COM ports and USB ports. Additionally, a free mini-PCI card slot enables the integration of further fieldbus interfaces. A DVI interface, located on the motherboard, permits the user to connect two separate displays and allows the development of extensive visualisation solutions. The CB3054 3.5" motherboard features a PCI-Express extension that offers flexibility using minimum space by offering further interfaces inside and outside the industrial PC.